More than 500 million human beings live in absolute poverty. Right now. Their lot is not changing. More than 15 million children die of hunger every year. Starve. To. Death. Can you picture 20 classrooms holding 20 kids each? Okay. Now multiply that again by 20. See them in all your mind’s eye, all those 8,000 kids in those classrooms. Multiply them by 20 more. And then 20 more. And then 20 more times. You still don’t have the magnitude of the lives of children slowly starving to death each year because the imbalance of our earth is so horrifically extreme. Devote an entire industry to the manufacture of one kind of object. 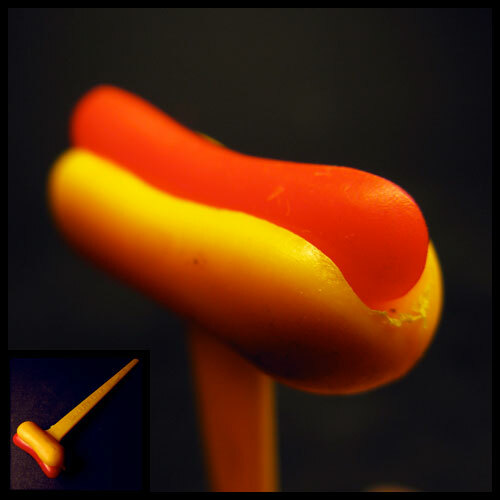 A tiny plastic hot dog atop a plastic stake. That gives your own well-nourished kid a chuckle for the half a second before he plucks it out and gobbles down 400 calories of refined-sugar-frosted, luridly colored angel-food cake. And hucks this thing into the trash. Sorry to get so … heavy.